A team of researchers at Cornell University has developed a way to dramatically improve the resolution of confocal microscopy. They describe the technique in a paper they have had published in Physical Review X.
Confocal microscopy is a type of microscopy that uses a laser along with optics to create images of objects at the nanoscale, but due to various types of noise, the images produced can sometimes turn out fuzzier than researchers would like. To reduce this fuzziness, the researchers with this new effort came up with mathematical models that could be converted to computer code to eliminate some of the noise, and in so doing, reveal more detail of the objects under study. The precision that can be obtained using optics, the researchers note, is limited by statistical noise, which has been defined by the Cramér-Rao bound. But, the researchers found, confocal microscopes were not offering even that resolution because information was being lost. Light from a dye, for example, when conducting fluorescence imaging was being lost as it spread, reducing precision. They noted that such spreading and the loss that resulted could be described mathematically. 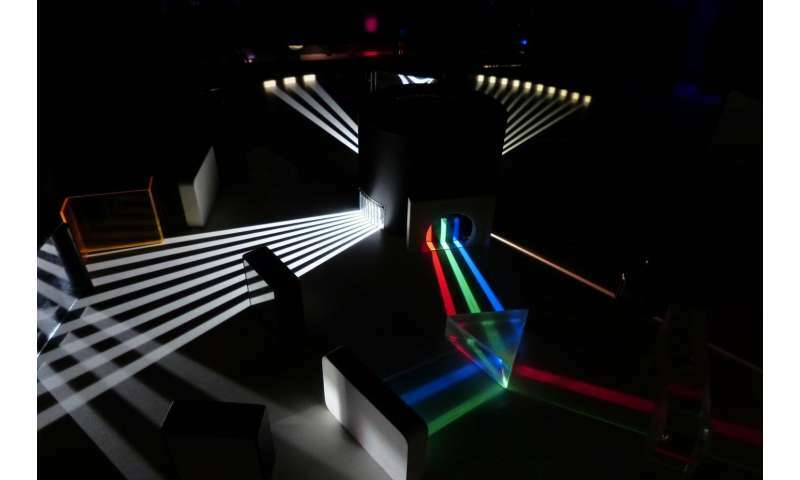 Because of that it was possible to build a model that could take into account the unevenness of light distribution. Then by adding parameters, they could essentially recover that lost light and add it back to the image. They have named this method parameter extraction reconstructed images (PERI). The PERI model was then incorporated into computer code that could analyze an image and then produce a new one that was sharper than the original—it was quite intensive, running for a day on powerful computers at Cornell and on Amazon's cloud mainframe. The team tested their technique by scanning colloid particles and sending the results to the computer for crunching. The results were an obvious improvement, as can be seen in the resulting photographic comparisons—they achieved approximately 10 to 100-fold improvements in resolution. The new method offers clear benefits, but as the team notes, it also has some limitations. New models have to be built for each type of object to be studied—also, researchers must know in advance the shape of the object under study. The code is open source, so anyone who wishes to test, use or modify it for their own purposes is free to do so. More information: Matthew Bierbaum et al. Light Microscopy at Maximal Precision, Physical Review X (2017). DOI: 10.1103/PhysRevX.7.041007. Microscopy is the workhorse of the physical and life sciences, producing crisp images of everything from atoms to cells well beyond the capabilities of the human eye. However, the analysis of these images is frequently little more accurate than manual marking. Here, we revolutionize the analysis of microscopy images, extracting all the useful information theoretically contained in a complex microscope image. Using a generic, methodological approach, we extract the information by fitting experimental images with a detailed optical model of the microscope, a method we call parameter extraction from reconstructing images (PERI). As a proof of principle, we demonstrate this approach with a confocal image of colloidal spheres, improving measurements of particle positions and radii by 10–100 times over current methods and attaining the maximum possible accuracy. With this unprecedented accuracy, we measure nanometer-scale colloidal interactions in dense suspensions solely with light microscopy, a previously impossible feat. Our approach is generic and applicable to imaging methods from brightfield to electron microscopy, where we expect accuracies of 1 nm and 0.1 pm, respectively.